There are many ways of mastering the world-famous Neapolitan pizza dough. One could read (and re-read) a recipe, seek tips from experienced Italian pizza makers or reach for a nifty visual guide like the one below. 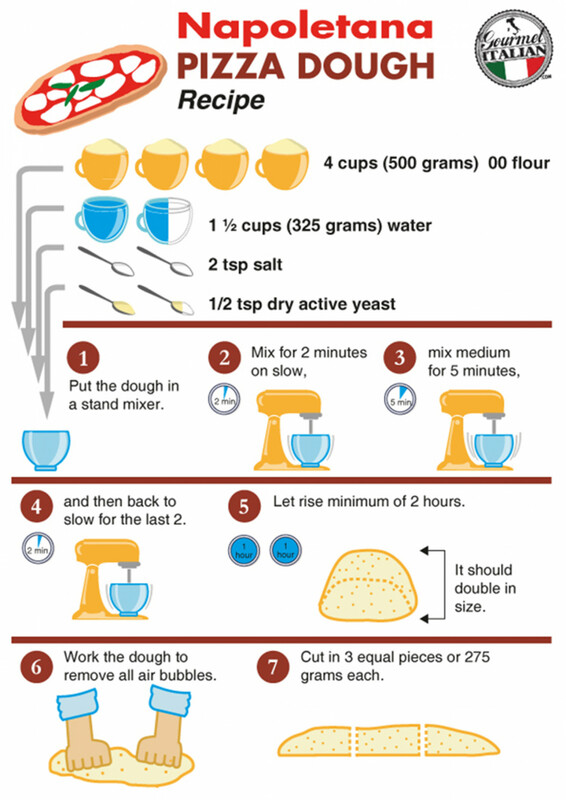 This infographic from Gourmet Italian illustrates how to make Neapolitan pizza dough in seven easy steps. All it takes is four simple ingredients: flour, water, yeast and salt. Thanks to mixing, rising and kneading, they magically become a gorgeous crust once baked. You'll note the recipe calls for "00" flour, which can be hard to obtain outside of Italy. This low-protein flour has special flavor characteristics so it's worth the extra effort to try to find it at your local specialty shop. Craving pizza already? After checking out the visual recipe below follow these six tips for making the ultimate Neapolitan pizza and get inspired with these tasty pizza toppings.